It’s Saturday, it’s already 10pm and we are just hanging around on the couch, tired from a day walking miles exploring every corner of Copenhagen. Odilia and Alberto are visiting me and I have been showing them around. Suddenly, the excitement of a new plan for the night hits the heavy body and within couple of minutes we are ready! 10:32pm – here we go with the map in the lap, cycling down and up the street… and these streets are all flat! 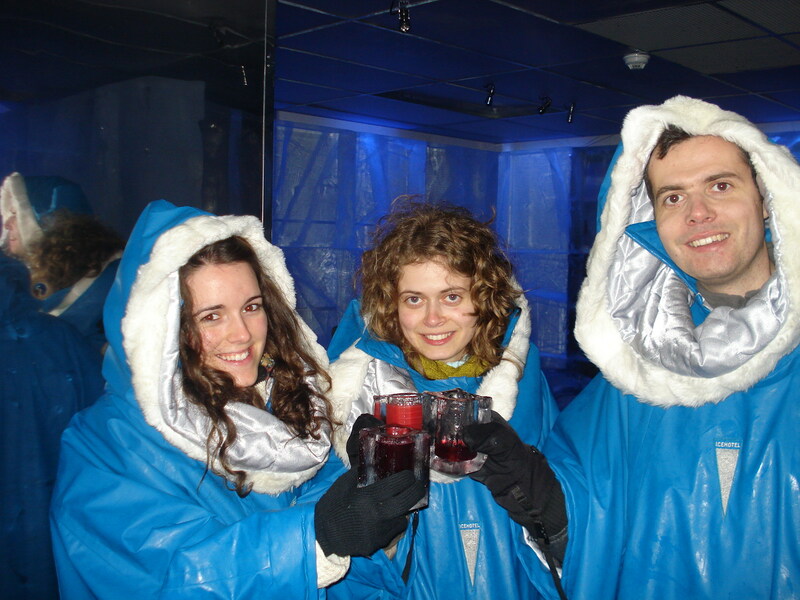 11pm – we arrive at the IceBar! Price for the entrance: 150Dkk ~21€ (ouutcchhh! )… well, with one cocktail included! We dressed in the special warm blue clothes and we got in, literally, in the freezer! It’s -5ºC inside! We can handle it! I thought out loud. Deep breaths and I feel the freshness of that light blue water! The walls are made of ice, so are the chairs and the tables, even the bar is made of ice! The theme of the bar is motorbikes! Every season they invite an artist to redecorate the bar with sculptures made of ice! Hmmm… my feet start getting too cold! Maybe it’s better to get our drink: blueberries vodka cocktail served in a glass made of ice!!! After a couple of minutes, it’s impossible to hold the ice glass… and my feet are getting numb! But drinking through that glass is addictive! Looks like I’m drinking through an ice lolipop! This was a unique experience and truly refreshing. When we left the bar, the streets felt like a heater for us, besides the fact it was only 2ºC. ………..It was a wonderful night!……..
– the drink of the girl whose Alberto knocked down with his dance. – Odilia got all enthusiastic riding the ice motorbike and fell off the other end! hahaha it hurts my cheeks of laughing!